I’m not going to lie to you, I find Valentine’s Day a very daunting prospect, whether you’re single or in a relationship it can be a stressful day. If you’re single, there can be the pressure to find something to do to take your mind off the occasion or who to spend it with. Or, if you’re in a relationship, what gift do you get your other half? What plans do you make? How much should you spend? It’s fraught with difficult decisions so I’ve made a little list to try and make it a little bit easier for some. 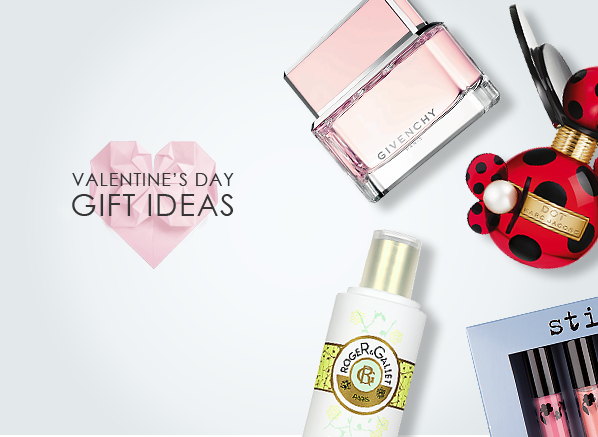 All women love to feel valued so Valentine’s Day is the perfect opportunity to get on her good side. Wow her, let her know how special she is and of course buy her lovely presents and flowers. It’s worth it I promise. Marc Jacobs Dot exploded on to the market in 2012 and has fast become one of their most popular fragrances. It’s light, sweet and dangerously charming. It’s so juicy it’s impossible not to like it, so why not buy the special lady in your life the whole set. This gift set features a 50ml Eau de Parfum, 75ml shower gel and 75ml body lotion for all day scenting, a guaranteed winner in my opinion. What do you buy the man who has everything, or the man who wants nothing? Something spectacular that’s what! A classic scent that is rich, masculine and spicy. Aramis has gained cult status and it has such a huge variety of products. So why not buy the man in your life a whole selection of them? He’s guaranteed to be impressed by the vast array of products included and obviously by the scent itself. He’s happy, you’re happy, what’s not to like? Now, if like me you’re a lady and you’re single, why not buy a present for your best friend? It may sound sad but I’m intending on buying a gift for my flat mate Katie, who is also single. I don’t see why, just because you’re single you can’t enjoy Valentine’s Day! Everyone likes receiving gifts so I don’t intend on being excluded from that, just because I don’t have a boyfriend. OK, single lady rant over! Katie isn’t the love of my life (although we may spend the rest of our lives together with our many cats we have rescued from the animal shelter) but I know her quite well so I’m planning on getting her something nice, I’ve thought of a couple of options. I introduced Katie to Roger and Gallet after I attended a training seminar where we received a couple of little freebies. Amongst them was the Roger and Gallet The Vert Body Lotion and she wouldn’t stop raving about it. So as a little treat I might get her the matching shower gel so she can use them both together for a longer lasting scent. Now, Katie is a make-up fiend. She’s always scouting out which products are best for her needs but lip colour isn’t her strong point, it’s something that she’s not really tried before so I’ve found her the perfect starter kit, the Stila Long Wear Liquid Lip Colour Set 4 x 3ml! This set features a collection of four highly pigmented and creamy matte lip colours that are a great introduction to the world of lip colour. The four colours included; Caprice (hot pink), Petal (pale pink), Coral (peach pink) and Muse (natural mauve), are enriched with Vitamin E and Avocado Oil so they not only last for up to 6 hours, but they’ll be great for her lips too! I’m not sad really! But I am definitely going to buy a present for myself. Why not? I’m a catch…honest! I smelt this and fell in love! It’s such a beautiful scent, mysterious and rich, with a beautiful dry down of my two favourite notes in a fragrance, Vanilla and Tonkin Musk. It’s a scent that will go on in the morning and you’ll catch a whiff of it every now and again throughout the day and it’ll remind you how beautiful it is. It isn’t overpowering, just very very sophisticated, I’ll be buying it so I can emanate that! Certainly reasonably priced, though one colour is not for me. But it is not as long-lasting as i had hoped. This entry was posted on Wednesday, February 6th, 2013 at 11:05 am and is filed under Bath & Shower, Fragrance, Gifts, Guest bloggers, Hints & Tips, Make-up. You can follow any responses to this entry through the RSS 2.0 feed. You can skip to the end and leave a response. Pinging is currently not allowed. holiday is a good opportunity to express you love to everybody.